KANSAS CITY, Mo. — The revived Hy-Vee Arena, formerly known as the Kemper Arena, comes with a lot of fanfare as the first multi-level sports complex in the nation. The arena sat mostly vacant for years. "Costing taxpayers a million dollars a year, just to keep the lights on, and the city owned it," Kansas City Councilman Scott Taylor said. The arena just opened this week, and nearby businesses such as Rockstar Burgers are already seeing the difference. "Now we are seeing more of all those different kinds of people coming in, so it's awesome getting to know people or getting to know their backgrounds and stuff like that," Rockstar Burgers waitress Payton Tennendorn said. While there are still some empty storefronts just across the street from the Hy-Vee Arena, others are quickly getting leased. "We were very lucky and fortunate to find this awesome space that has so much of this new potential coming up," KC Pinoy owner Chrissy Nucum said. KC Pinoy was previously a food truck, but Nucum wanted to have a brick-and-mortar store and thought the place on Genessee Street was the perfect spot for the venture. "It's just this awesome kind of revitalization of the neighborhoods," Nucum said. 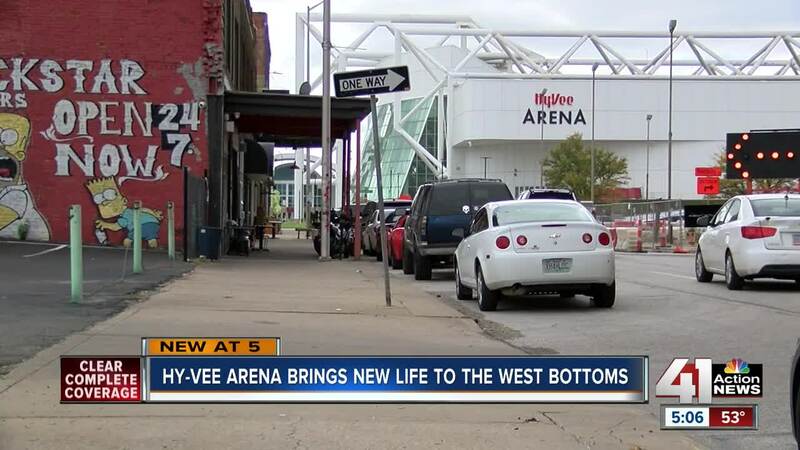 The Hy-Vee Arena is not only bringing more foot traffic to the area, but more development is starting to take shape in the West Bottoms, including an apartment complex with more than 200 units. "These will be nice apartment buildings, targeted toward families, to bring families living there in the West Bottoms," Taylor said. The apartments will draw more people to live in the neighborhood, boosting the West Bottoms' economy. "It's going to be crazy down here. I mean we've always had a lot of people but I don't think that we'll ever have as much people as we're about to have, and we're all really excited about it," Tennendorn said.